Nabe is a traditional Japanese simmering dish. We simmer sea food or meat with various vegetables in Dashi stock seasoning with cooking Sake and soy sauce. At home or in restaurants we usually set a cooking pot on a countertop range on the table and share it as cooking the dish. 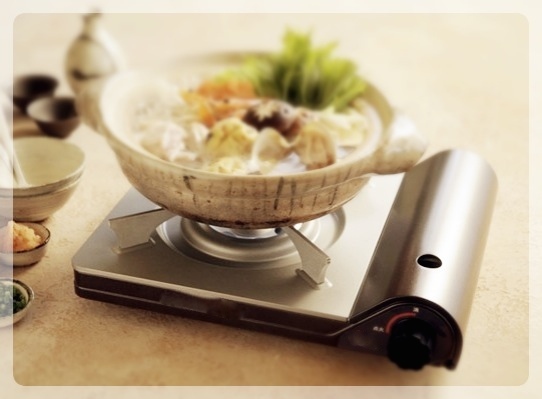 The dish and the cooking warm us and the room up so it is common to have Nabe in winter. 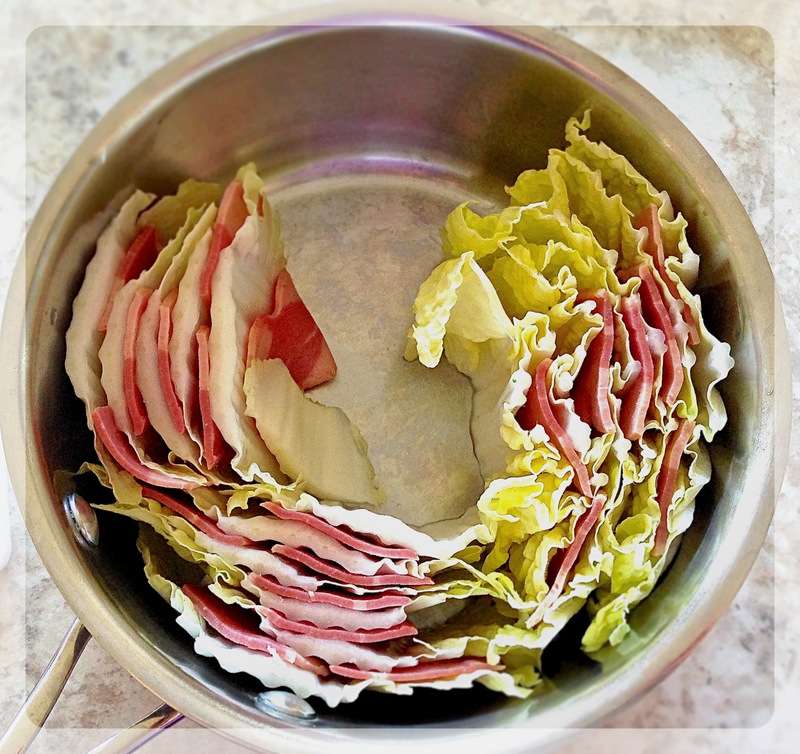 Today I will introduce you to bacon (I use turkey bacon, but you can use any kind) and Napa cabbage millefeuille Nabe, which requires that we set bacon and Napa cabbage leaves alternatively in a pan and simmer in Dashi stock. This time I used Kelp Dashi stock, but you can use any kind of stock you want. We add many kinds of vegetables to Nabe but Napa cabbage is a must-have vegetable. 95% of Napa cabbage is water so it is easy to eat for everybody because of it’s tender texture. The cabbage water also makes Nabe juicy even when simmering for a long time. Napa cabbage also has great nutrition. It is low calorie and high in vitamin C, potassium, iron, magnesium and so on. 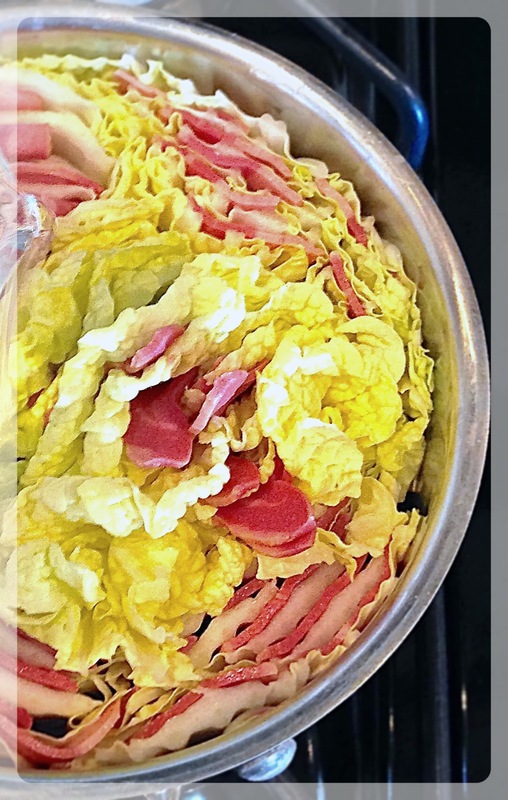 Juicy, tender Napa cabbage and bacon makes your Nabe very delicious! I hope you will like it!! Categories: Hot pot, Nabe | Tags: bacon, Dashi, Delicious, Easy, Healthy, Hot pot, iron, Japan, Kelp, Low calorie, magnesium, millefeuille Nabe, Nabe, Napa cabbage, potassium, protein, recipe, Vegetable, Vitamin C, Winter | Permalink. Thank you! Now this is very popular in Japan! Yours looks so pretty how you arranged it! I love nabe, but mine is always simply chucked in the pot haha.